Ever wondered how a lighthouse came to be at the museum? Image: Kate Pentecost / ANMM, 2017. At 22 metres tall Cape Bowling Green Lighthouse seems a solid, immovable structure. In fact, it was designed for ready disassembly and has been moved at least three times in its 150-year life. It has also been continuously modified throughout its history. The lighthouse at the museum is only partially the lighthouse that was built at Cape Bowling Green in 1873-4. The lighthouse and its changing history challenges ideas about the preservation of immovable cultural heritage. 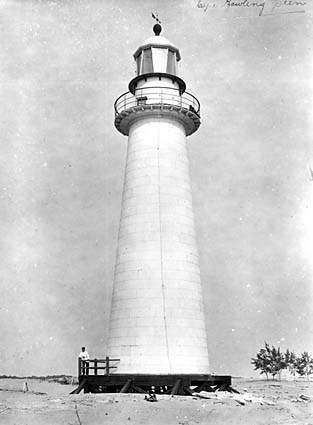 Cape Bowling Green lighthouse in 1917. Image: National Archives of Australia A6247 B32. Immovable cultural heritage is cultural property inextricably tied to place or intended to occupy a particular location. Examples of immovable heritage include archaeological sites, monuments, rock art and buildings. Generally speaking, attempts to relocate these heritage items or their content can result in damage and a loss of meaning. Cultural heritage professionals usually seek to preserve immovable heritage in its original location. The parts making up the original lighthouse had a penchant for travelling even before assembly. It appears that the metal cladding, cast iron lantern room, mechanism and lens were manufactured in Britain. The ironbark timber structure was milled and fitted in Maryborough, then shipped out on the schooners Henry Albert and Fairy to the Cape. The lighthouse apparatus was shipped from Brisbane on the schooner Dawn. 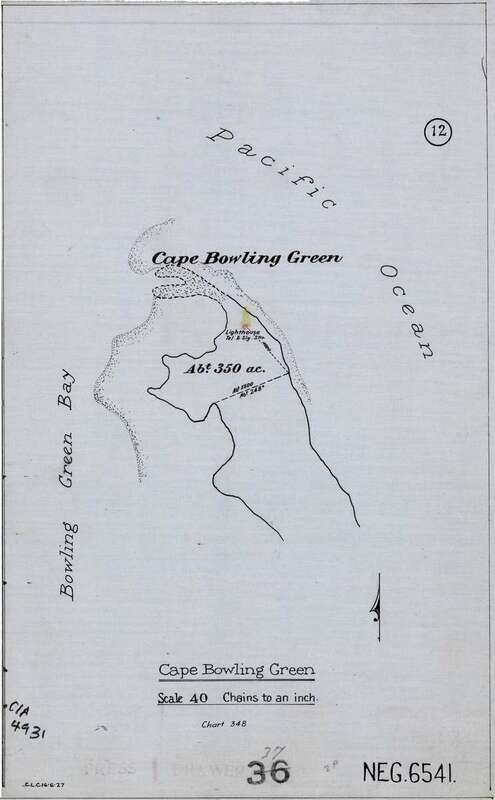 Map of Cape Bowling Green, 1927. Image: National Archives of Australia BP374/1 NEG6541. 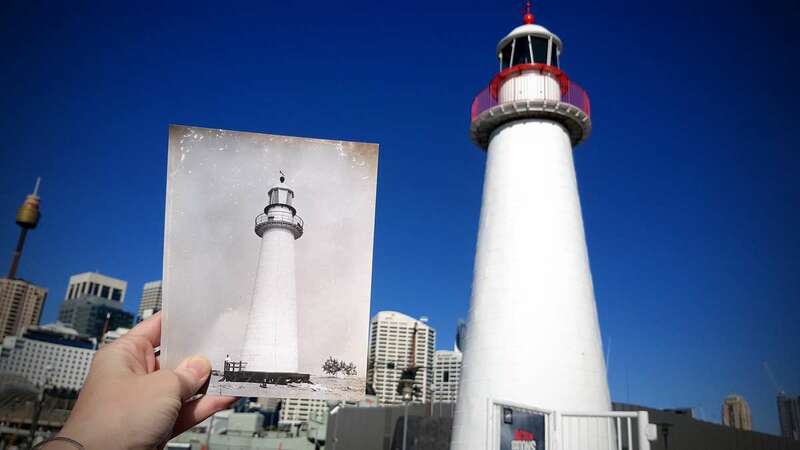 This was not the first or last time the lighthouse was changed. Perhaps the most significant modification was destaffing and automation in 1920. The kerosene fuel system was replaced with acetylene and a sun valve controlled the operation of the light. 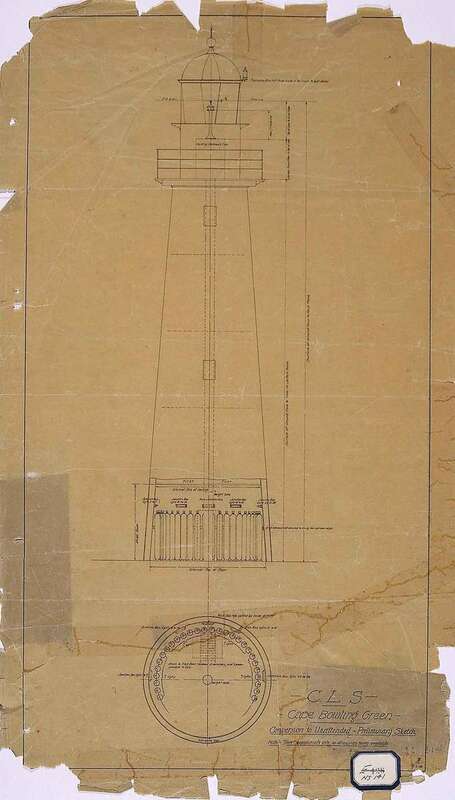 Preliminary sketch for the conversion of the lighthouse to an unmanned configuration, 1918. Image: National Archives of Australia A9568 3/1/2. Much more recently, the museum replaced the damaged weathervane and the front door. Photographic evidence showed that the weathervane was not original. The National Archives holds records demonstrating that the door dated from 1979. How do we understand and care for a lighthouse which is not in its original location or composed entirely of original historic fabric? Cape Bowling Green Lighthouse is not static. It exists in a continuity of change in our care, consistent with its in-service life. The lighthouse is no less valuable or interesting for being composed of layers of history. Elements of the lighthouse will continue to be replaced as necessary to keep the structure sound, secure and available for visitors to enjoy. In line with conservation ethics, we will intervene as little as possible, and maintain as much of the as-collected fabric as we reasonably can. — Rebecca Dallwitz, Senior Objects Conservator. Look out for our next blog on the 1987 dismantling of Cape Bowling Green for its move to the Australian National Maritime Museum. The museum is carrying out essential conservation on the lighthouse. This work is made possible by a generous donation from the Australian Maritime Safety Authority (AMSA). The lighthouse will be accessible during International Lighthouse Weekend on Sunday 20 August from 1-4pm. Please contact us for opening hours on other days.